The eighth named storm, third hurricane, and the first major hurricane of the 2017 Atlantic hurricane season, Harvey developed from a tropical wave to the east of the Lesser Antilleson August 17. The storm crossed through the Windward Islandson the following day, passing just south of Barbados and later near Saint Vincent. Upon entering the Caribbean Sea, Harvey began to weaken due to moderate wind shear and degenerated into a tropical wave north of Colombia early on August 19. The remnants were monitored for regeneration as it continued west-northwestward across the Caribbean and the Yucatán Peninsula, before re-developing over the Bay of Campeche on August 23. 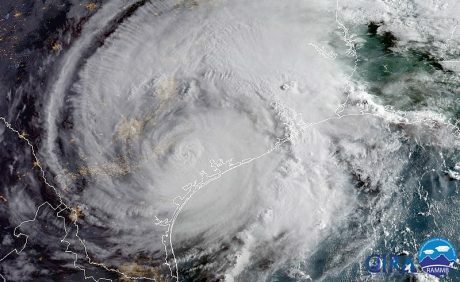 Harvey then began to rapidly intensify on August 24, re-gaining tropical storm status and becoming a hurricane later that day. Moving generally northwestwards, Harvey’s intensification phase stalled slightly overnight from August 24–25, however Harvey soon resumed strengthening and became a Category 4 hurricane late on August 25. Hours later, Harvey made landfall near Rockport, Texas, at peak intensity.